The Sea Fox 226 Traveller is yet another boat from this company that sports all the hallmarks one looks for in quality glass. Not only that, it comes pretty much standard with everything one needs to get going on the water for a day or more. Perhaps in this case add some shade and throw in a BBQ and the rest of the weekend is yours! If you have been browsing this website and checked out any of the Sea Fox boats you'll come up with a number of common denominators. Quality finish, more storage than you could believe possible and nearly all of it water proofed, well thought out internal design that seeks out the last cubic centimetre of space turning it into functionality in one way or another. The only thing you won’t find is the personal satisfaction you'll get from its on-water performance – that can only be attained with a visit to JSW Powersports who are based just a lure throw from the Gold Coast. And you won’t be disappointed. 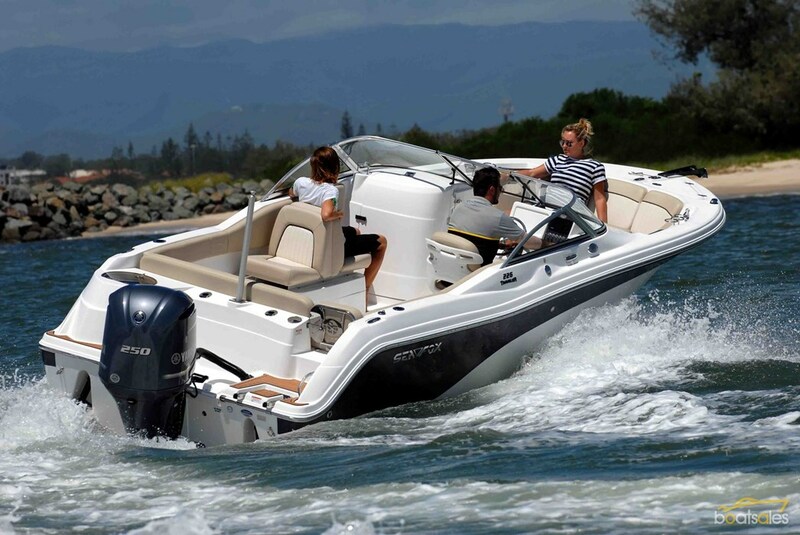 The boat we tested was armed with Yamaha’s F250 four-stroke outboard rather than the standard 175hp model and also had a coloured hull strip as an optional extra. 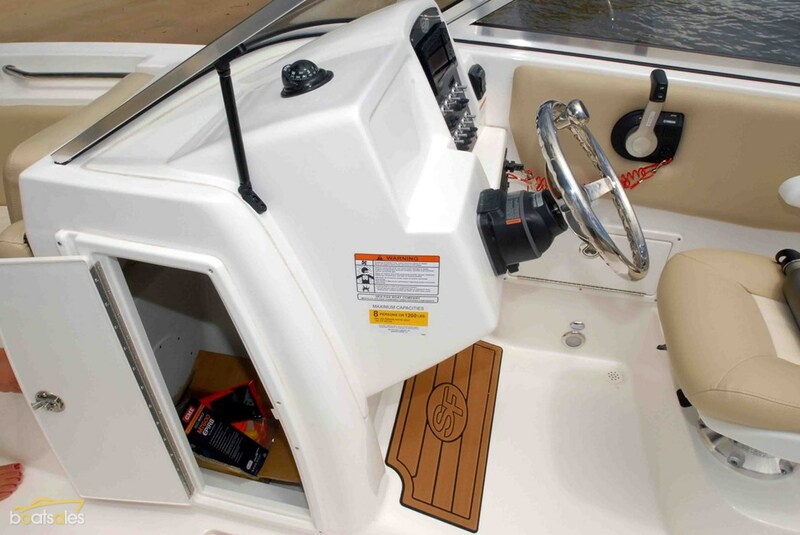 Sea Fox’s Pro Package was included and consisted of foot mat, gas struts on the fish box lids and a skier tow bar which was removable. With the outboard upgrade and options removed, the price as tested of $99,345 ebbs back to $82,425. For the base price you'll get plenty of standard kit. 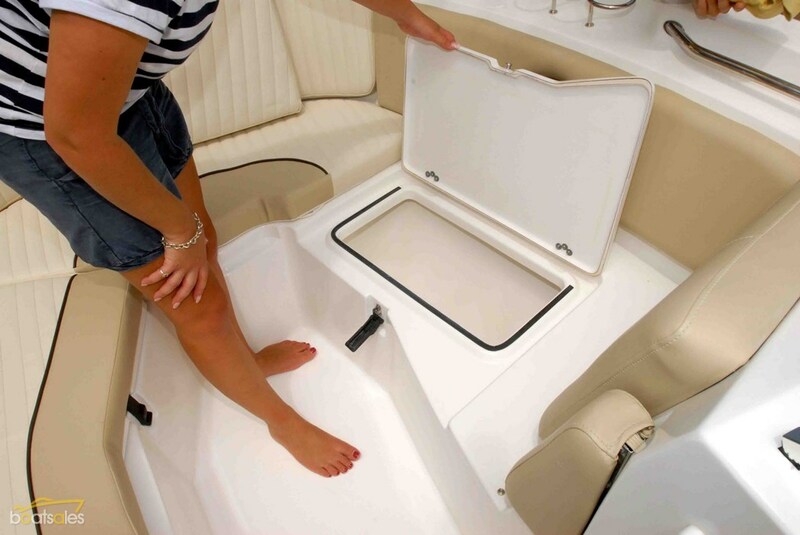 The ice box that fits under the rear lounge is 34 litres in volume, and the live-bait tank which comes aerated as standard are included in the package. Five cup holders are moulded into the liner and the bait rigging station with freshwater sink, cutting board with tackle centre will be a good place to make sandwiches on a day out. (After a clean post fish dissection of course). 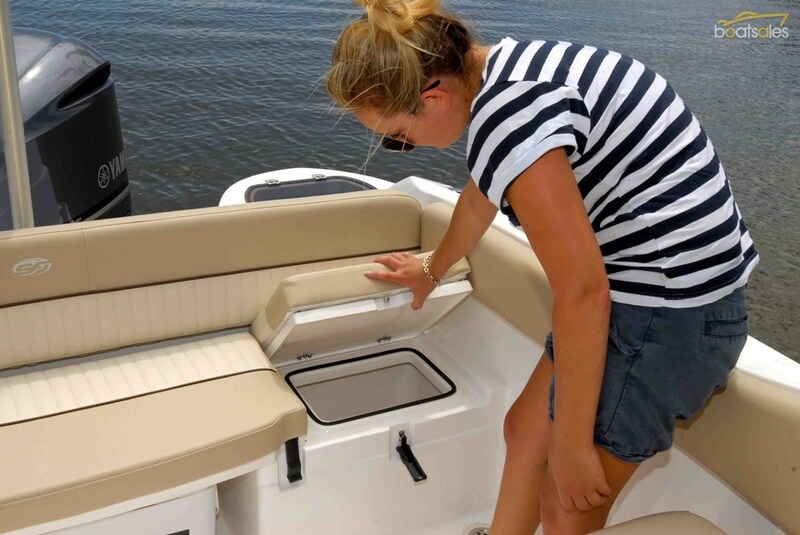 The transom boarding ladder and 45-litre freshwater deck wash comes in the standard pack along with six stainless steel rod holders in the aft cockpit, pull up cleats, raw deck wash... and the list goes on. And all of the stowage is standard in the hull liner, and there’s no shortage of that either. We would have liked to have seen a standard bimini to suit our climate but you would have to opt for the wakeboard tower which includes a bimini and that will bump the price another $6,395 – ouch! The layout on this traveller sprawls from bow to stern. Typical of Sea Fox, there is not a sharp edge or corner to be found in the cockpit liner, rather just smooth lines and more stowage space than you could point a barge pole at – and most of it waterproof. High sills, lack of joins at deck level and quality rubber seals all go towards making this boat easy to live with. 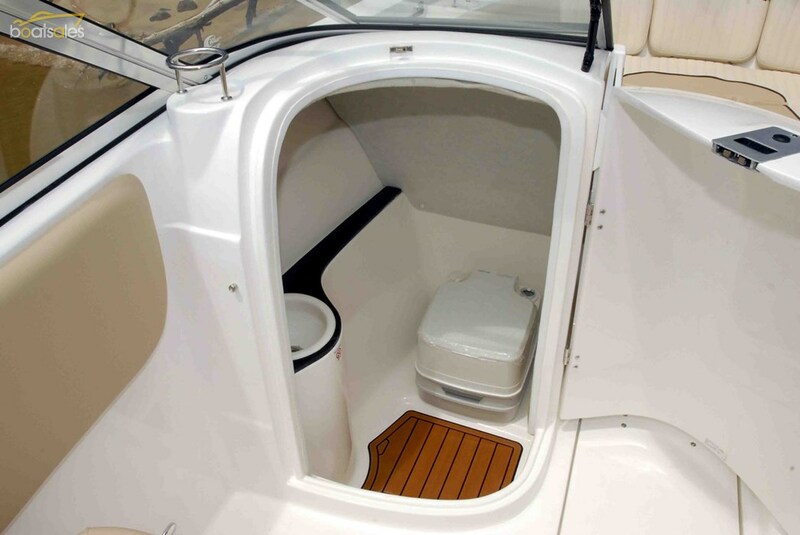 The bowrider pit is curvaceous and plush upholstered with the seat cushions removable to allow access to stowage hatches below. Seated there, you can reach across and hang onto the safety rails without putting strain on the shoulders when the inertia kicks in on tight turns. The rails are built down into the inside corner of the coaming so they don't become an obstacle to those climbing over the gunwales when beachside. 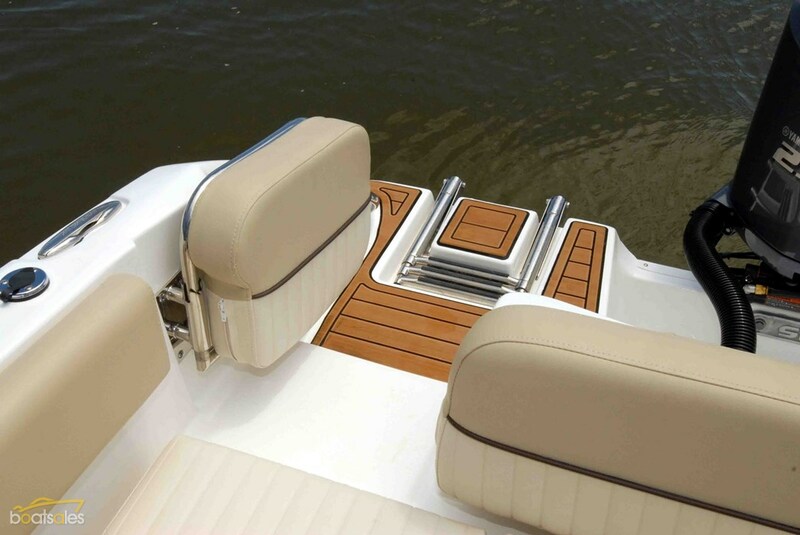 Upholstered cushioning is fixed around the rest of the coamings for a comfortable lean including on the walk-through transom door which is mounted on a sturdy stainless-steel swinging frame. This leads out onto an uncluttered boarding platform which has a telescopic fold down boarding ladder recessed below deck level starboard side. In the port corner an aerated live-bait tank protrudes out into the aft corner of the topside liner keeping potential fish slime away from the seating area. If you have managed to get away from the non fishers you will find six well-placed rod holders servicing the rear cockpit and under the port side lounge seat another fish box is built in. The ski pole on this boat is removable and its base location would allow for all sorts of after-market fishing add-ons such as a shotgun outrigger. In keeping with the theme of smooth and clutter free, the quality stainless steel cleats are all pop-up. Both the helm seat and passenger seat are built on modules that are formed as part of the cockpit liner so their internal stowage areas are as waterproof as is possible. The passenger seat is a back-to-back setup that can be unlocked and collapsed flat for use as a day or night bunk. The helm chair is a comfortable swivel-type bucket while the rear is a seat base only that lifts to reveal storage fitted with a removable bucket. 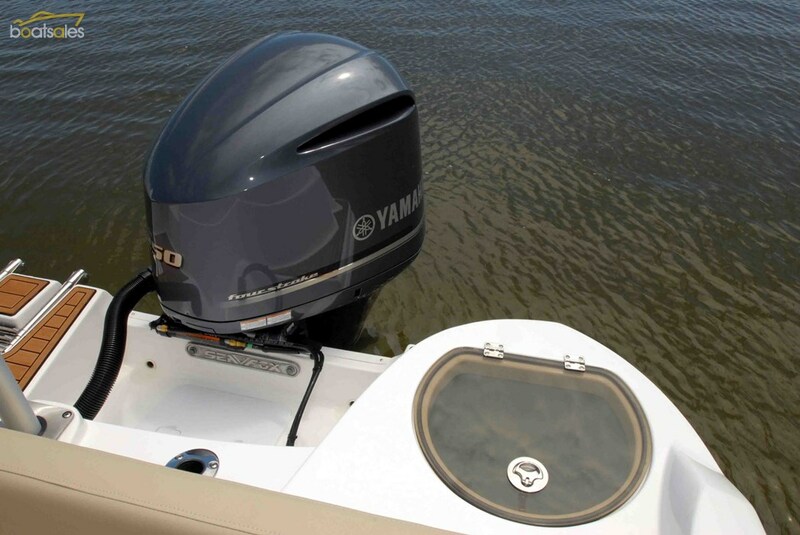 At the helm, Yamaha’s instrumentation is neatly fitted with the rest of the switch gear to the starboard side of the wheel. 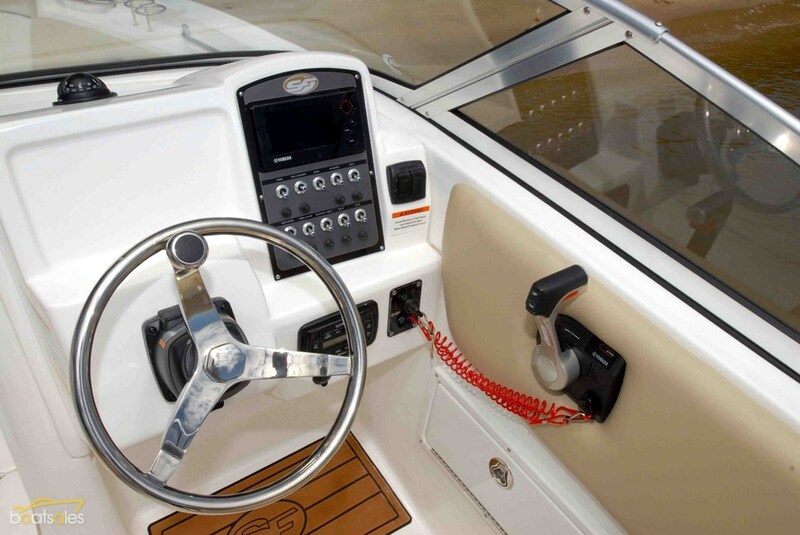 The panel directly in front of the skipper would take a screen of around 10 inches, and while the brow is high enough to stow gear against the windscreen it is still low enough for an average person to drive with ease and safety. The portable head installed into the midship bulkhead to port really tops this rig off nicely as an overnighter and may well be a deciding factor for the family. With a dry hull weight of 1678kg and a 19-degree deadrise we expected a smooth ride – and we got it. We were maxed out on the transom with the big 250 and if you opted for minimal horses at 175hp then loaded the eight allowable bodies on board you may have wished you had dug deeper into the pocket in the first place. With three up, we found a huge amount of available torque through the range and hole shot was very snappy. 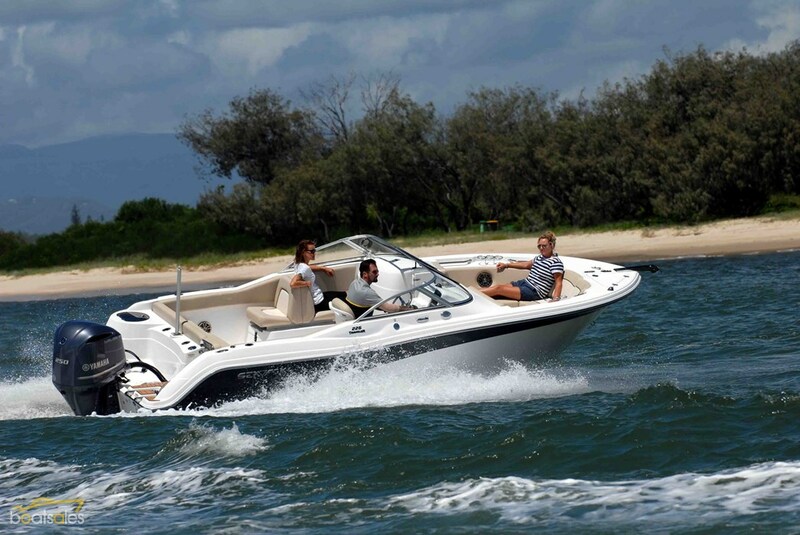 Comfort in the bow rider section was excellent even over chop and big powerboat wakes, response at the helm is as good as it gets – effortless and easy on the arms. 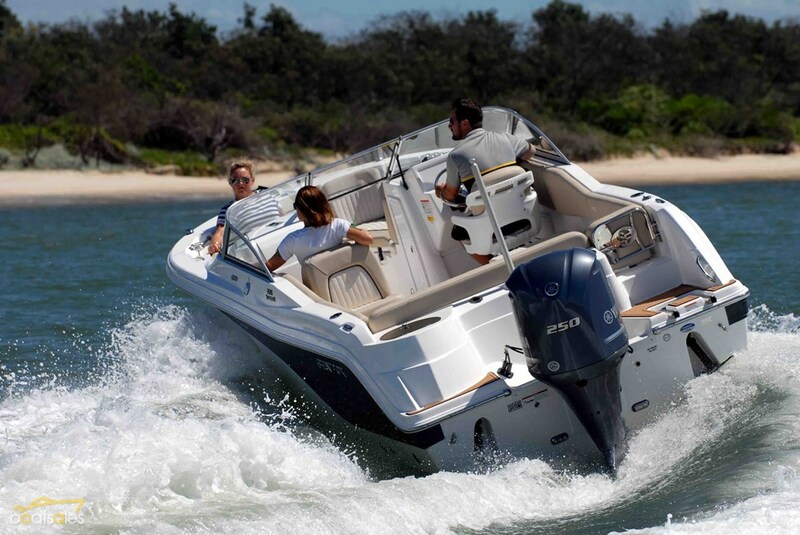 When it comes to economy, you can expect a fast idle of 1000rpm at 3.9 knots to use just over three litres per hour. At 3000rpm and 14.6 knots we were using 15.9 litres per hour. The Traveller settles into its own at 4000rpm and 25.5 knots with a consumption of 28 lph and if you have deep pockets you could run around at WOT of 5700rpm burning just over 73 lph. Yet another Sea Fox that ticks nearly all of the boxes. It is a trailer boat slotting into the larger end of the market and as such will need a substantial tow vehicle such as a LandCruiser or Patrol. The beam of this boat might infringe on some state legislation when being towed on the road but being less than 2.5m in Queensland it won’t be an issue. In many states it is a case of a couple of banners and head lights on when towing in daylight hours and a flashing orange light on the tow vehicle when towing at night. Check your state legislation to get it right. >> Smooth lines and smooth running. Priced from: $82,425 with Yamaha F175 four stroke outboard. 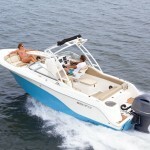 To read the review on boatsales.com click here.